Please have a read of our blog to see what’s been happening in the world of Google Business View in Manchester, Bolton, Rochdale, Haslingden, Ramsbottom and the surrounding areas. If you want to be the first to take advantage of our special offers then please sign up to our newsletter on the right of the page. If you need to speak to us about a specific post or prospective Google Business View commission then please use the Contact page or ring us on one of the numbers below. I had worked with Synergy Dental Group on another project earlier in the year but I mentioned Google Business View and its benefits and they jumped at the chance to join one of the newest and exciting projects from Google. Google Business View can transport your customers into your place of work and allow them to have a 360 degree virtual look around your business. So why would a dentist be interested in this ?? Their group is the latest in a line of dentists that have harness the power of Google Business View in Manchester. They realise that not only does it showcase their surgeries in a way no other medium can but it also reassures patients that their surgeries are clean, friendly modern environments to visit. Not only do they get all the optimisation benefits of a Google Business View virtual tour but they also received a standard photography commercial shoot of each of their surgeries with copyright free images that they can use on their literature, social media or websites etc. If you would like to know more about Google Business View and how it could benefit your business please contact us and we can arrange a no obligation meeting to discuss your requirements. What a great day we had at Battlefield Paintball in Duckinfield. Have a virtual wander around this great attraction. 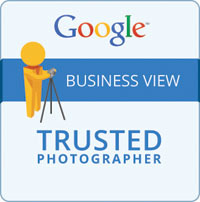 This business was perfect for Google Business View in Manchester. Harness the power of Google and convert strangers to customers when you bring your business to life with a 360 degree virtual interactive tour on Google Street View. http://www.ukbusinessview.org/wp-content/uploads/2013/04/googlebusinessphotos.jpg 0 0 admin http://www.ukbusinessview.org/wp-content/uploads/2013/04/googlebusinessphotos.jpg admin2014-04-07 11:23:552014-04-07 11:25:12Google Business View Manchester Goes Paintballing !! 360 Images and the Google Business View project have already completed assignments all over the North West of England including Manchester, Ramsbottom, Haslingden, Heywood, Oldham, Bolton, Rochdale, Barrow-in-Furness, Whitby to name a few. We are happy to travel anywhere in the North West or even UK if the commission requires. Martin Stembridge Photography is also available for Weddings, portraits, Criminal injuries etc. please go to Martin Stembridge Photography website for more details.